If you survive detonation of a nuclear weapon, we share here what to do next. This article is aimed at women who are centrepoint in their family. This advice will help your family survive. Start learning. Make an emergency plan. Share with your family. Don’t scare kids but make sure they know where to go & what to do. A Thermonuclear Bomb is detonated. These are the main dangers to you. deadly, invisible radiation (after the physical blast and heat passes you there’s minimal time to get to your shelter). Close people will not survive the blast unprotected. We will explain that further. If you survive the initial detonation because you are some distance away or lucky enough to be well shielded you now need to protect yourself from nuclear radiation. Your survival depends on the air currents, where the blast took place, and what you do about these factors. Your family’s safety depends on you as a family centerpoint and a mother staying alive and healthy. Take this seriously. Your babies may perish without you. Take care of yourself. Best advice: know in advance what to do and where to go; don’t leave unless you are 100% sure of an “all clear” from your government; stay in your shelter. You cannot survive three seconds exposure to a nuclear blast. Get down. If you sense a bright flash look around fast for a trench, curb, wall, ditch, then dive or just drop where you are if there is nothing better. Lie face down. Clasp your hands behind your head. Close your eyes. Don’t look. After the flash, heat and blast waves, peel off your outer clothes and run to your shelter and wash yourself clean under running water with soap to remove radioactive particles. Plan now to do this step. Running water could well be a bucket of water and soap or a tank fed shower. There may be no municipal running water. There may be no municipality. Dispose of your clothes in a sealed plastic bag to keep you and your family away from any radioactive dust that fell on you. You will toss this far from your “L”-shaped shelter entrance. Wear a mask while bundling your clothes. The flash across the sky will be some seconds before the heat, sound wave and the shock waves hit you. Heat will be first. Get down and be shielded. That means if the flash comes from your left, make sure you find a ditch with a wall of dirt between you and where you saw the flash come from. If you don’t know, that’s not too surprising because if you are close the flash seems to come from everywhere. A high curb, a hole in the ground, a ditch, or culvert may save you. If you are indoors, throw yourself down beside a wall or in a corner away from the light coming in the window. Lie flat on your stomach and hold the back of your head with both hands and brace for the worst. If you sense a flash you are in grave danger. Stay down. If you see a flash, you will likely be blinded. Don’t look. Closing your eyes is not good enough. Face down and cover. If you think you will not be impacted by nuclear war, consider the tornados, hurricanes, typhoons, cyclones and other natural disasters you will need to shelter from. If you are unprotected and unsheltered near a thermonuclear bomb blast you will die immediately or very soon after the event. Nuclear war has no winners. Read on. If a nuclear bomb is detonated in the Pacific Ocean as has been threatened by psychologically unwell male leaders, massive radioactive waves nearby underwater tests or atmospheric detonations may overwhelm you and your home if you live on a nearby island. Past experience says that on the limited evaluations of tests done already by the USA, that seems unlikely. Your biggest concern if you are far from a blast is that strong radioactive clouds will reach your home within the first seven days. Comprehensive studies have been conducted on underwater detonations. The blast throws up volumes of radioactive matter that becomes deadly particle clouds of radioactivity. Don’t let that fall on you or near you. This will kill you and your children. The elderly and infants will succumb to radiation sickness soonest. Please take care now to protect yourself and your family by planning ahead. Where will you go? We are going to explain how to best protect your family in the event of a limited or extended nuclear war. Think about basements, underground shelters, safe rooms surrounded by dense substances like lots of dirt, concrete, steel and wood, any or all of these materials, and no windows. We will come back to this topic. And we will talk about how to prepare food for storage. This is an ugly subject. As an organization with a strong medical unit, we have key members with passionate opposition to anyone who would cause this kind of illness among masses of people. It is a horrible way to die. Horrible. And no survivor of this radiation sickness caused by gamma radiation from deliberate nuclear blasts intended to slaughter humans, any humans they can kill, does not survive unscathed. Nuclear disarmament is the only way ahead. Radiation sickness can result from nuclear fallout or the nuclear blast radiation. The gamma radiation does a severe attack on your body’s organs by invisibly bombarding your body’s cell structure with small particles that are destructive to all body cells upon impact. A small amount of radiation will damage organs and a large amount will destroy organs. It is not a pretty sight seeing a person die from radiation sickness. It is horrible beyond the worst science fiction movie depictions. You may learn this first hand. Radiation sickness in any measure is a serious malady that has significant morbidity. Radiation sickness can force your death in minutes or it can shorten your life by months or years if you survive the initial symptoms. The measure of impact for survivors is dependent on how you were exposed; for how long; and to what measure of radiation. Treat all cases with the assumption the patient will survive. Hide from radioactive nuclear fallout. Take no chances. Be surrounded by thick, dense materials. There are many types of fallout shelters. If you do not have one, you may find yourself in public shelters, subway tunnels, mines, mountain tunnel roads, or your basement. Ask yourself now, “What will I do?”. If you have a shelter, it may be in a gully, trench or ravine and covered over with concrete. It may also be your basement. If you are near a nuclear blast and have survived without spending any time exposed to the blast, you are likely still functional. Your next immediate threat is from flying or falling objects like cars, rooftops, air conditioners, cars, bicycles, concrete chunks or blocks and garbage disposal containers. Anything can be a projectile in a nuclear blast. A nuclear explosion can throw up over 5,000 tonnes of materiel high into the sky. Duck. The closer you are to a nuclear blast the less you need to worry about immediate fallout and the more you need to worry about falling debris. 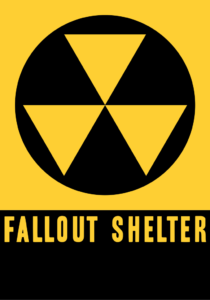 Don’t venture from your safe place (fallout shelter) unless you must and then only if minutes after the blast you can find a protected route to where you want to go to find family members, pick up first aid kits and any last minute items you will bring to your shelter. Remember this rule of threes: You can survive for about thirty days without food but only maybe three days without water. You will die after three minutes without air. You cannot survive three seconds of exposure to a nuclear blast. Think about each person in your family and their food preferences. Now think about their fist size. That is the volume of food, the volume of their fist, you will feed them each meal. Plan to live on these supplies for a minimum of 14 days. Being prepared for 30 days might serve you better, if you can store that volume. Bacteria grow rapidly at temperatures between 40 °F (4 °C) and 140 °F (60 °C); rice should be discarded if left for more than 2 hours at room temperature. You can survive a long time on just rice and water if you follow some rules.